After nearly seven hours of Black Friday shopping in NYC, my body feels like it just went through a trauma. My feet are swollen like a pregnant woman’s and my back is sore from carrying the baggage I inevitably picked up. Still — it was kind of worth it. 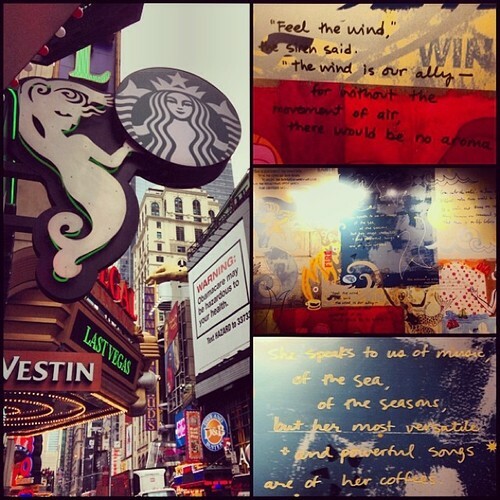 And I got to visit a Starbucks along the way. While most retail stores — and practically everywhere near Times Square — were much more crowded today than usual, I can assuredly say that the Starbucks on 42d and 8th avenue sees this kind of crowd daily. This location is connected to the Regal Cinemas and stays open later than most Starbucks in the city to keep late-night movie goers and passers- by caffeinated. Inside, this Starbucks is average sized — maybe a little big by Midtown standards — and has a heavy crowd flow. Obviously, it houses as lot of tourists, but it also has a decently sized seating area and a few random bar stool to maintain the crowd. But its most distinctive characteristic is its elaborate decor. Even the Starbucks logo outside is louder than most, but then again, in this neighborhood, your signing needs to be over-the-top to stand out from the hundreds of other flashy and eccentric marketing ploys. And — yes — clearly, I am one of those humans. Especially on Black Friday, there would be no life in me without coffee.